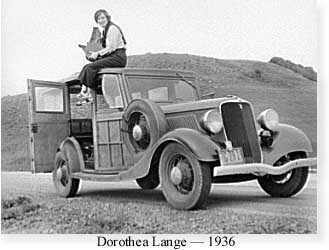 Dorothea Lange (1895-1965) had early interest in photography. She worked with Arnold Genthe, and had her own photography studio in San Francisco. She was part of the West Coast Bohemian group of photographers, and later married  and divorced  famed artist Maynard Dixon. 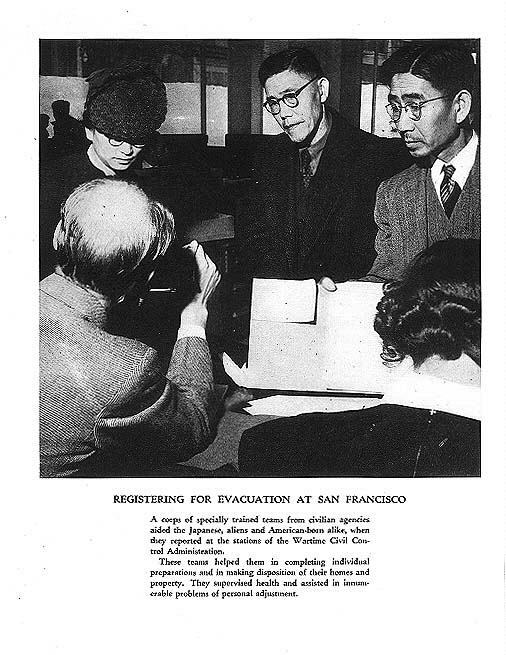 In the 1930s she was involved with the migrant farm workers program of the California Emergency Relief Administration, and later began photographic assignments for the U.S. governments Farm Security Administration, Office of War Information, as well as the War Relocation Authority, from which these photographs are drawn. 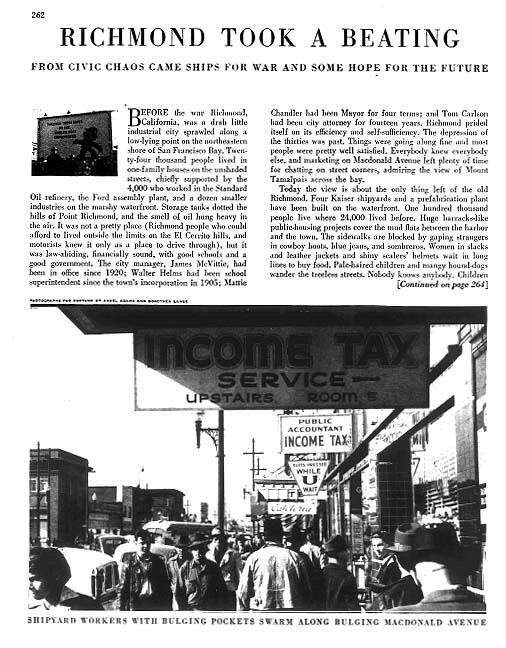 ... documented the change on the homefront, especially among ethnic groups and workers uprooted by the war. 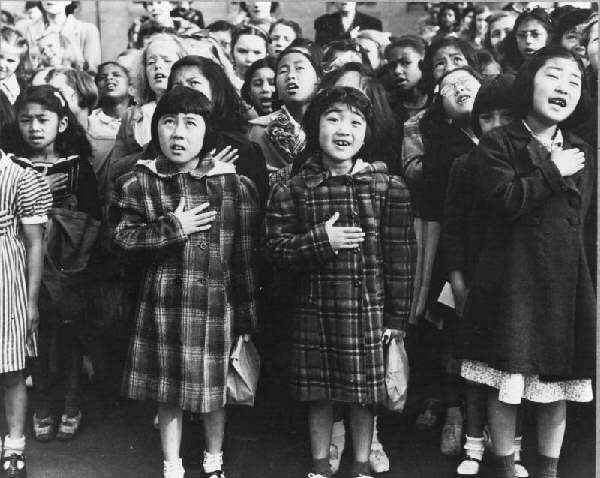 Three months after Pearl Harbor, President Franklin Roosevelt ordered the relocation of Japanese-Americans into armed camps in the West. 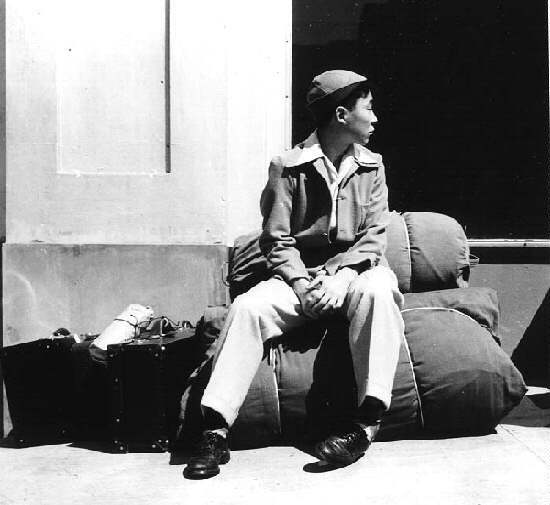 Soon after, the War Relocation Authority hired Lange to photograph Japanese neighborhoods, processing centers, and camp facilities. 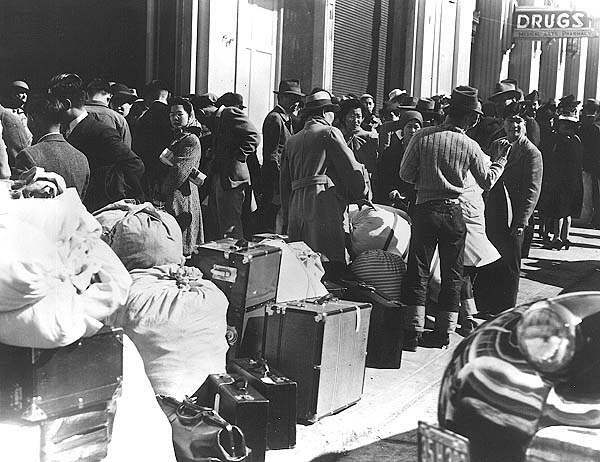 Langes earlier work documenting displaced farm families and migrant workers during the Great Depression did not prepare her for the disturbing racial and civil rights issues raised by the Japanese internment. Lange quickly found herself at odds with her employer and her subjects persecutors, the United States government. To capture the spirit of the camps, Lange created images that frequently juxtapose signs of human courage and dignity with physical evidence of the indignities of incarceration. Not surprisingly, many of Langes photographs were censored by the federal government, itself conflicted by the existence of the camps. Online documentation provided by the Library of Congress is relatively skimpy and poor, however, all of the exhibited photographs were taken in San Francisco. The first photograph, Lange at Work, was not taken by her, but most likely by Clem Albers, a former San Francisco Chronicle photographer who then worked for the War Relocation Authority. The picture shows Lange positioned, at far right, to photograph the internees. This uncredited photograph was taken at the Wartime Civil Control Administration building, 2020 Van Ness Ave. 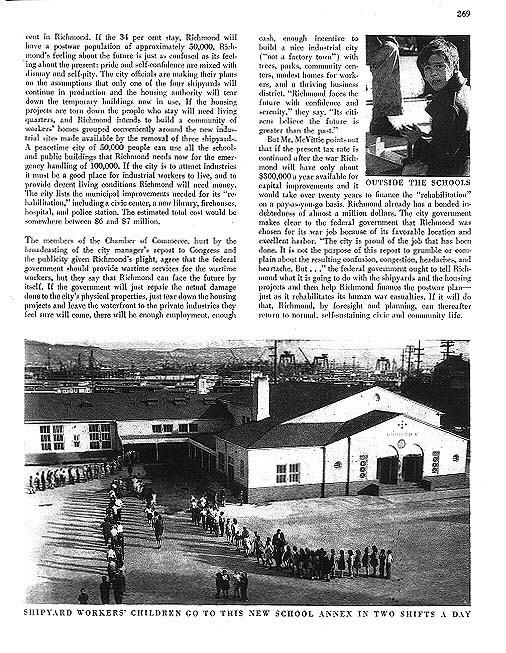 These internees would have been among the 664 Japanese moved to Santa Anita Race Track, in Southern California, to wait the opening of Manzanar. 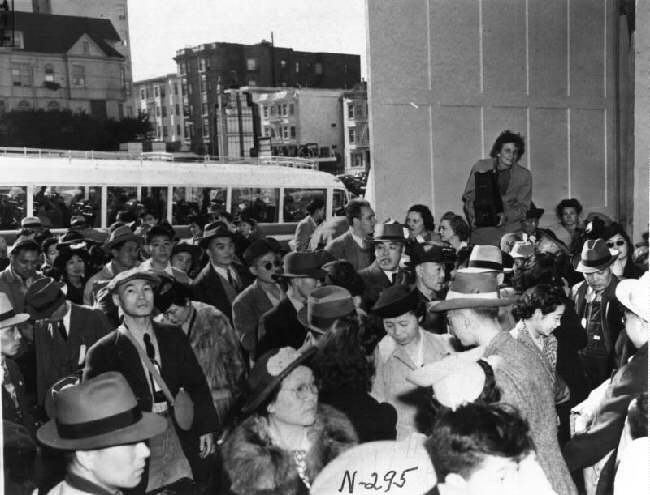 They were ordered to report April 6, 1942 to either 2020 or 1701 Van Ness Ave. 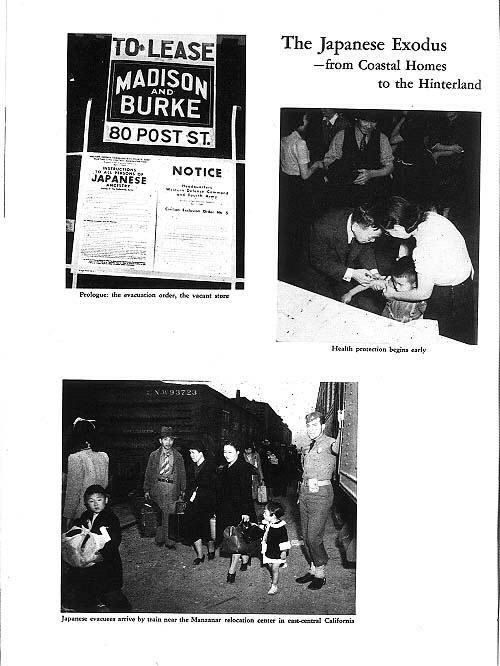 These photographs were taken at the Wartime Civil Control Administration building, 2020 Van Ness Ave., April 6, 1942. The next photograph was taken at Raphael Weill Elementary School, O'Farrell and Buchanan streets. Weill was a noted San Franciscan who founded the White House Department Store. 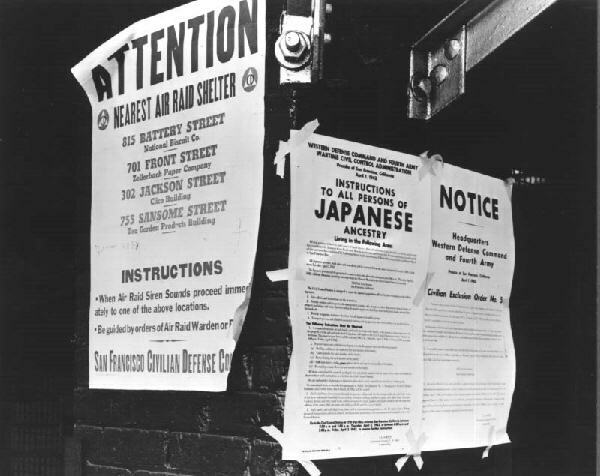 Air raid shelter instructions, as well as orders for Japanese Americans, posted in the area of Battery and Sansome streets. The first building listed on the shelter instructions, National Biscuit Co., 815 Battery Street, currently houses KPIX-TV and other CBS broadcast properties in San Francisco. 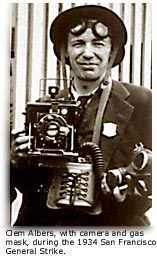 Paul Schuster Taylor, author of the next exhibited item, met Dorothea Lange in the early 1930s while she was involved with the California State Emergency Relief Administration, (SERA) working with migratory laborers. He married Lange after her divorce from famed artist Maynard Dixon. Taylor, a social scientist and prolific writer, wrote Organization and policies of the Sailors Union of the Pacific, in 1922 as his UC Berkeley Ph. D. thesis. Through the 1930s he wrote extensively about migrant farmer issues in California and Texas, and collaborated with Lange on American Exodus, a Record of Human Erosion in the Thirties, published in 1939 by Reynal and Hitchcock. Following World War II, Taylor was deeply involved in the University of California loyalty oath controversy, and, from the 1950s to the 1970s, wrote extensively about California water issues. In 1970, he authored Communist Strategy and Tactics of Employing Peasant Dissatisfaction over Conditions of Land Tenure for Revolutionary Ends in Vietnam for the House Foreign Operations and Government Information Subcommittee. 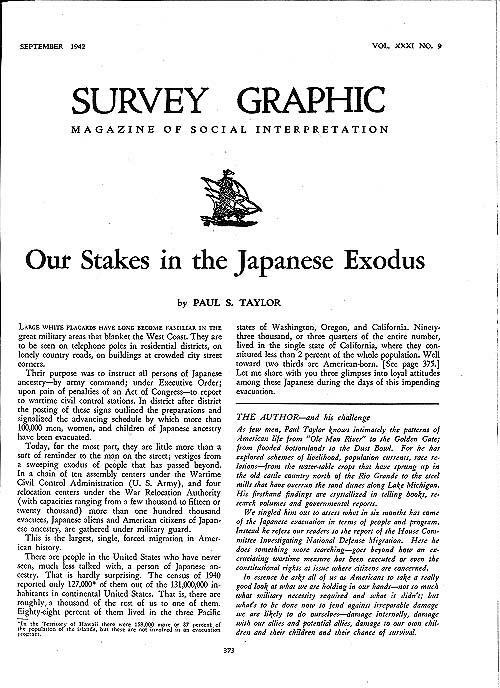 The Libary of Congress exhibit includes pages from Our stakes in the Japanese Exodus by Paul S. Taylor, published by Survey Associates of Stroudsburg, Pennsylvania. The article is extracted from Survey GraphicVol. 31, No. 9 (Sept. 1942), and includes photographs by Dorothea Lange. One, of a To Lease sign, was photographed in the 400 block of Grant Ave. in Chinatown. One of the Library of Congress exhibits is of general Bay Area interest. 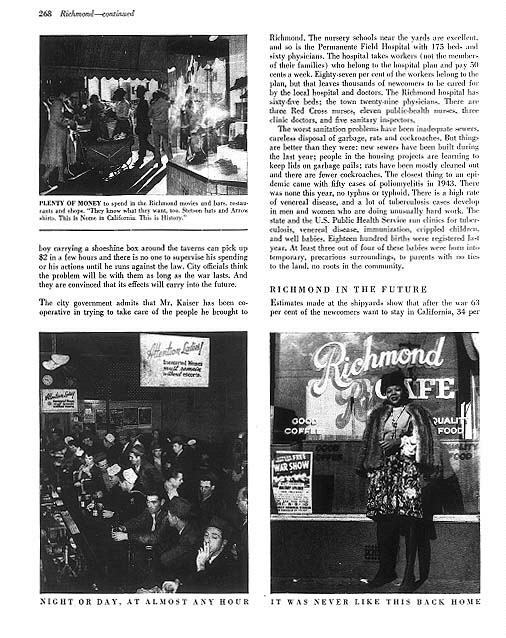 Richmond Took a Beating details the impact of the war, and construction of Kaiser Shipyards, on the small community across the Bay.